The Aztec Calender was one of the most important parts of this ancient civilisation. The Aztecs had what we would consider today to be complex and unique interpretations of time and how to measure life. The Aztec even had multiple calenders with multiple days for each, the main two were the Xiuhphualli Calender or the Aztec year calender, which comprised of 365 days, and the ritual calender, the tonalpohualli, the Aztec day count which comprised of 260 days. One of the most striking icons of the unique Aztec civilisation is the Aztec sun stone. The Aztec Calendar or Sun Stone is also known as Cuauhxicalli, which translates as ‘Eagle Bowl’. It was believed to have been carved around 1479 at the height of the Aztec Empire as dedication to The Sun God. This piece of art was made of basalt, which is a volcanic rock, and at around 4 feet thick and 12 feet wide, weighing around 24 metric tons, the sun stone is a weighty sculpture. The disk shaped stone is decorated with sun gods at the centre surrounded by writings showing the divisions of the Aztec cycles of time. The sun stone also has hieroglyphics and pictographs engraved on the surface, these depictions symbolise the four disasters that led to the ruins of the four primary Universes in the Aztec Cosmology. The Aztecs also used the solar calendar called Xiuhpohualli that has 365 days in a year, and 260 days as a religious day cycle of the planet Venus. The 365 days were however divided into 20 day months called veintenas with 4 to 5 day weeks. The sum of this came to a total of only 360 days which was called Xihuitl. The remaining 5 days were added after and were believed to be unlucky, so the Aztecs made them into days of nothing, actually called Neomontemi days and they were used as a time for festivals. The Tonalpohualli was the sacred calendar used by the ancient Aztecs. The Aztec priests used the 13 day trecenas, and a 20 month period for godly rituals. The 13 days were for each god it represents, and this totalled 260 days signifying the ritual calendar the Aztecs called Tonalamatl. The belief of the Aztecs was that the gods were competing for power, and in order to maintain the world’s balance, each god has been given their own time to rule under this calendar. Therefore the Aztecs divided the days up evening so as not to offend any of their gods. The combination of the 2 calendars meant that the dates would only repeat by a cycle of 18,980 days or 52 years or a calendar round called Xiuhmolpilli. It came from a Zapotecprophecy of the 13 Heavens and 9 Hells were each 52 years long totalling 1,144 years. According to Mexican myth, the 1st Sun was destroyed by the jaguars. The 2nd Sun was destroyed by great winds. The 3rd Sun ended with rain of fire, and the 4th Sun was flooded. It is believed that we are at the 5th Sun period called Nahui-Olin which means ‘Sun of Earthquake’ and a time of suffering and testing from the gods. This Sun, which began in 3113 BC and purported to have ended December 24th 2011 will also perish, but the ultimate outcome is a spiritual destiny of discovering man’s inner god-form that will transpire at the 6th Sun. The last or the 7th Sun man will reach the highest spiritual form that he will become telepathic. 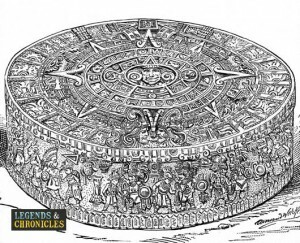 The Aztec calendar was discovered on December 17th, 1790, and was buried at the main square of Mexico. For a time the Aztec calendar hung on the wall of the metropolitan Cathedral’s Western Tower until 1885. At that point in time, the President General, Porfirio Diaz ordered its transfer to the national Museum of Archaeology and History. At present the Aztec calender is displayed at Chapultepec Park in Mexico City’s National Museum of Anthropology, and is still a sight to behold these days.